Podiatrist, Dr. Adam Zanbilowicz, was ready to move his practice from Sechelt to Vancouver Island. With his big relocation set to take place, he turned to My Loud Speaker to get him the best start in his new home of Nanaimo, BC. We were tasked with spreading the word and ensuring that Dr. Zanbilowicz would be able to transition to his new practice with patients already booked for the complex services that he does best. It was time to put his best foot forward – if you will. We started by sitting down with Adam to create a marketing plan in place, and research his new location to identify his key differentiator – and uncover the key message that would resonate with his target audience: “committed to the pursuit of permanent long-term solutions.” We discovered that the largest portion of his clients were females in the senior age bracket – then it was time to hone in on how to reach them. Our main goal in 2016 was to give Adam the best start possible in his new practice in Nanaimo. To create the results he needed, we had to build the integral foundational tools in a tight timeline to accommodate his move. First, we established a clear and consistent message and target demographic to focus all Adam’s marketing efforts, with a focus on being efficient and effective. 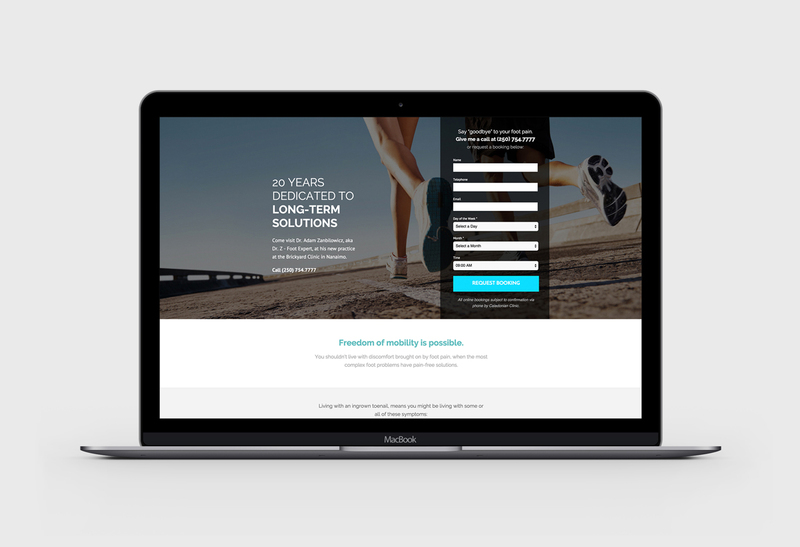 Through a promotional campaign, we designed and created two unique landing pages that were specific to his top services: custom high-end orthotics and ingrown toenail surgery accompanied by a Pay-Per-Click campaign. 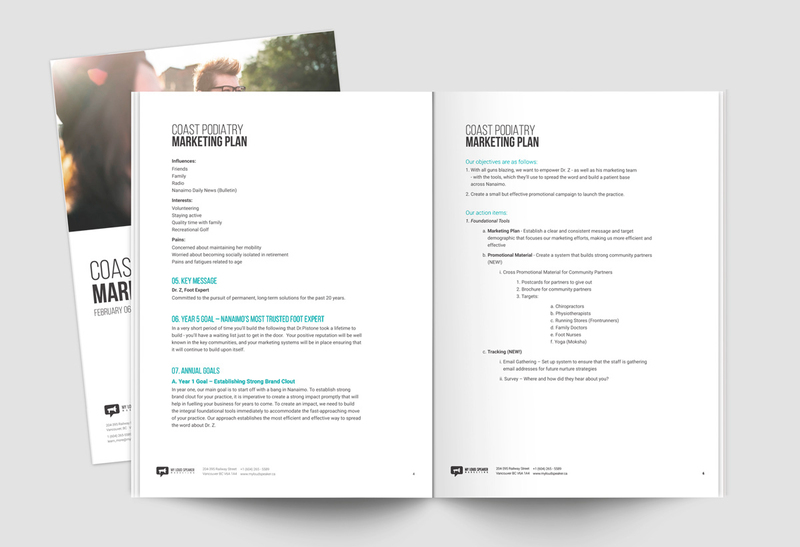 Secondly, we created two radio ads using playful copy to generate buzz in the Nanaimo community on the airwaves. 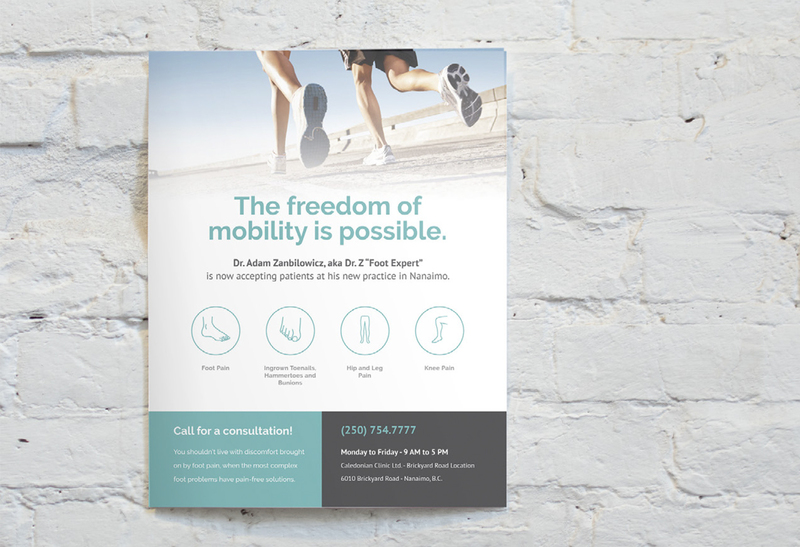 One of the first roadblocks that jammed a toe in our door was that not everyone knows what you mean when you say “Podiatrist.” We wanted to take another approach to ensure that we would capture as many patients as we could for Dr. Z, so we simplified – rather than Podiatrist, we went with Foot Expert. By changing the title in which we were promotion Adam, in two simple words the public would know exactly his specialty. Not to mention, we cut ‘anbilowicz’ from Zanbilowicz, and left Adam with Dr. Z – memorable, catchy and less of a mouth full. We knew it was important to track everything we put out to the public – radio ads, Facebook and the landing pages – to ensure we could continuously adjust his campaign to make it as successful as possible, so we used trackable phone numbers on both the landing pages and the radio advertisements. We also created Facebook Ads that targeted the Nanaimo community, to reach as many of Adam’s bulls-eye targets as possible. 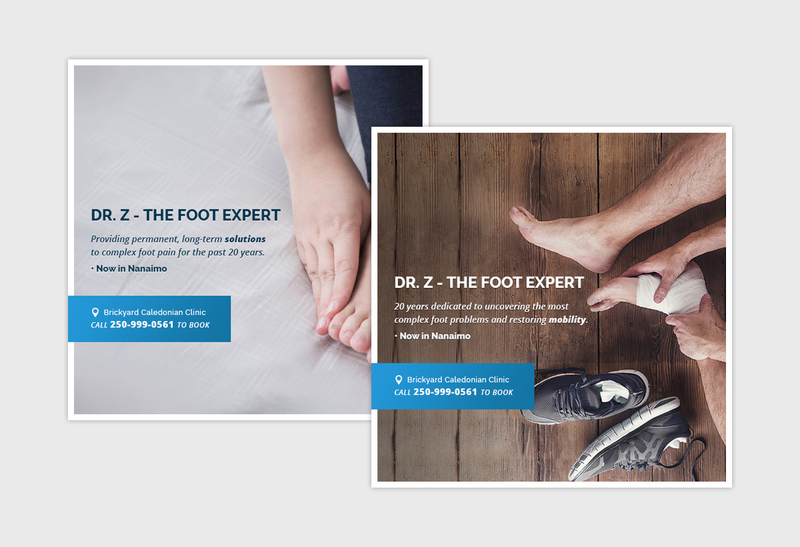 Through our marketing plan process, we were able to arm Dr. Z with targeted landing pages that would attract the right type of clients to his clinic for his top service, ingrown toenail surgery and high-end custom orthotics. We also gave Dr. Z the guidance he needed to ensure that he would be able to continue to grow his new practice in Nanaimo by creating clear goals for him to reach, which included networking within the new community. Before his big move, our marketing efforts paid off, and were already filling his schedule with new patients for his inaugural arrival at the Brickyard Clinic. 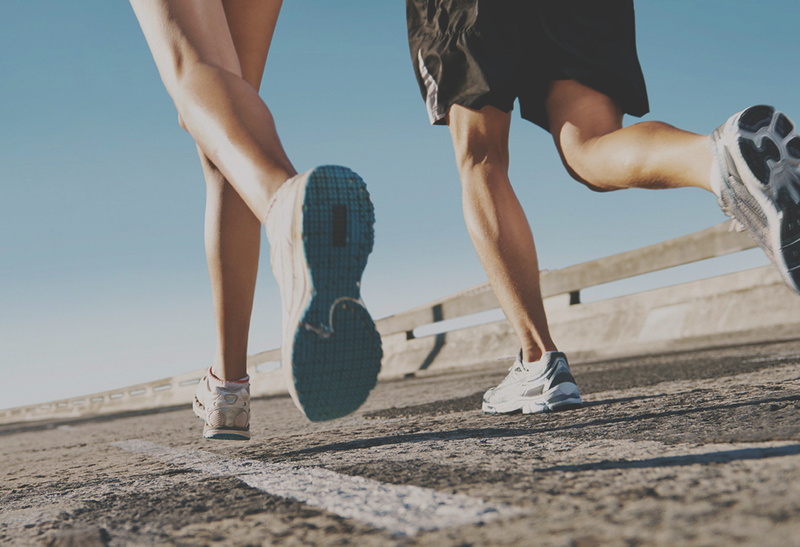 As of now, when you search for a podiatrist or foot doctor in Nanaimo, Dr. Z ranks first place – and that’s huge for his business and his community. We also achieved a conversion rate of 16.1% with a cost of CA$7.75 per acquisition. 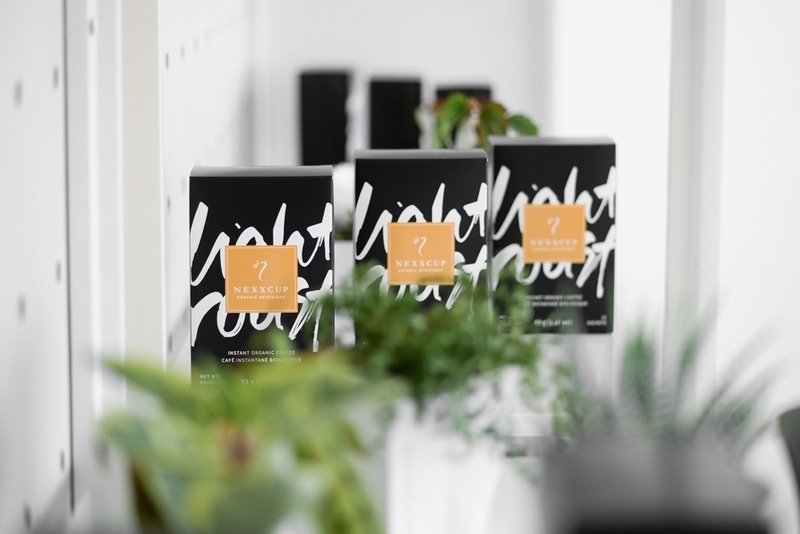 Within three months, we improved performance by 78% compared to the first month during which the conversion rate was 9% and cost per acquisition was CA$13.76. "I will really miss working with My Loud Speaker - but my campaign was so successful that they have put themselves out of a job."